11 May (Saturday): Italian Greyhound, Italian Greyhound sprinter (without CACIL), Whippet, Whippet sprinter (without CACIL), V. group (without CACIL). 12 May (Sunday): Afghan Hound, Greyhound, Azawakh, Borzoi, Deerhound, Irish Wolfhound, Magyar agár, Saluki, Sloughi, Galgo Espanol, Chart Polski. In case of low entry number, the competition will be held on one day: on the 11th of May 2019 Saturday. CACIL award regulations: According to the FCI Regulations for International Sighthound Races and Lure Coursing Events (point 5.1.3.) – attention: copy of one CACIB show result from adult class (not lower grade than “very good”) must be sent with the entry, otherwise the title won’t be given. Training or hobby coursing category is not available – only licence runs, entry must be sent in advance! Prizes: HuCE Coursing Clubchampion jacket for the winner (only if the owner is member of HuCE). Trophy for the 2nd to the 6th place. Coursing entry fee: 30 € per dog for the first 3 dogs, from the 4th dog (of the same owner) the entry is free of charge. With MEOESz (Hungarian Kennel Club or HuCE) membership: 5.000-5.000-5.000 Ft for the first 3 dogs, from the 4th dog (of the same owner) free of charge. Price of licence run: 7 € or 2.000 Ft per dog, per run. Membership cards for 2019 are available! 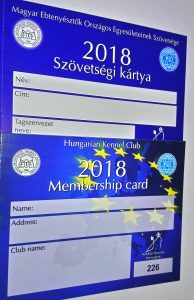 If you want to be our member and would like to use the advantages & discounts of the Hungarian Kennel Club + Hungarian Coursing Association membership, please contact us for further information! You can use it for all entries of the Hungarian Kennel Club events (shows, coursings, racings). The yearly membership (with foreign address, means not Hungarian) costs 12.000 Ft or 40 €. Hobby category for sighthounds without pedigree and/or licence book! Licence runs are possible, but we need your entry in advance! Entry fee: 25 € per hound for the first 3 hounds, from the 4th hound (of the same owner) the entry is free of charge. With MEOESz (Hungarian Kennel Club) membership: 5.000-5.000-5.000 Ft for the first 3 hounds, from the 4th hound (of the same owner) free of charge. Price of license run: 7 € or 2.000 Ft per hound, per run. Prizes: rosette for the 1-3. placements. Place: 1029 Budapest Feketefej utca 2. Prizes: HuCE Clubchampion jacket for the winner (only if the owner is member of HuCE). Trophy for the 2nd to the 6th place. Training or hobby coursing category is not available – only registered license runs! Entry fee: 25 € per dog (the 2-3. dog of the same owner: 25-25 €, from the 4th dog: free). With MEOESZ (Hungarian Kennel Club) membership: first dog 5.000 Ft, the 2-3. dog of the same owner: 5-5.000 Ft, from the 4th dog: free. Price of license run: 7 € or 2.000 Ft per dog, per run. The entry puts you under the obligation to pay the fee! No entry on spot! Our first coursing competition will be held on the 5th of May Saturday – detailed entry information and online entry are coming within days! 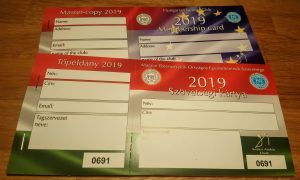 If you want to be our member and would like to use the advantages & discounts of the Hungarian Kennel Club + Hungarian Coursing Association membership, please contact us for further information! 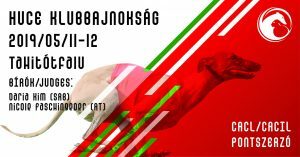 You can use it for all entries of the Hungarian Kennel Club events (shows, coursings, racings). The yearly membership (with foreign address, means not Hungarian) costs 12.000 Ft or 40 €. Die neuen Mitgliedskarten sind verfügbar! Wenn sie bei uns Mitglied werden möchten und die Vorteile & Angebote der Mitgliedschaft des ungarischen Kennel Club und des ungarischen Coursing Klubs nutzen möchten, kontaktieren sie uns bitte für weitere Informationen! Sie können die Karte für alle Meldungen von Veranstaltungen des ungarischen Kennel Club (Ausstellungen, Coursings, Rennen) verwenden. Die Jahresmitgliedschaft (mit ausländischer Adresse, bedeutet nicht ungarisch) kostet 12.000 Ft oder 40 €. 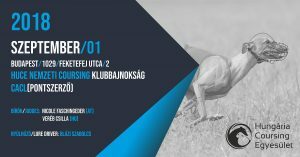 Welcome to the webpage of the first Hungarian coursing club called Hungária Coursing Egyesület. We hope you find every important information here. If not, please contact us. Our aim is to make an informative, up-to-date and clean-cut webpage that makes the communication easier with the members and the sport mates. HuCE Team wishes you a merry and fruitful new year!